I will preface this post by letting you know that for class, I had to create a blog post that was “visual”. Since I have only had one class in photoshop so far, this isn’t going to be pretty. The image at the top of this post shows my commute from Brampton to Centennial College’s Story Arts Campus near Pape/Danforth in East York. Since the entire trip door-to-door is just under 50 kms, I figured it wouldn’t be too bad. Google says it should ideally only take me 46 minutes. When I started this program in in January, it usually took me about 75 minutes to get to campus. Now with the Gardiner Expressway under repair, my average commute time is around 100 minutes, sometimes a full two hours on an especially bad day. To sum up my highway-oreinted trip it’s pretty simple: South on Highway 410, East on Highway 401, South on Highway 427, East across the whole Gardiner Expressway, North on the Don Valley Parkway, and then I just go up Mortimer to Carlaw and I’m there. Unfortunately it isn’t that easy. Everyday I go through a full spectrum of emotions on my agonizingly slow journey. The memes below, provide a pretty good picture of my range of emotions. Toronto seriously has the worst commute ever. 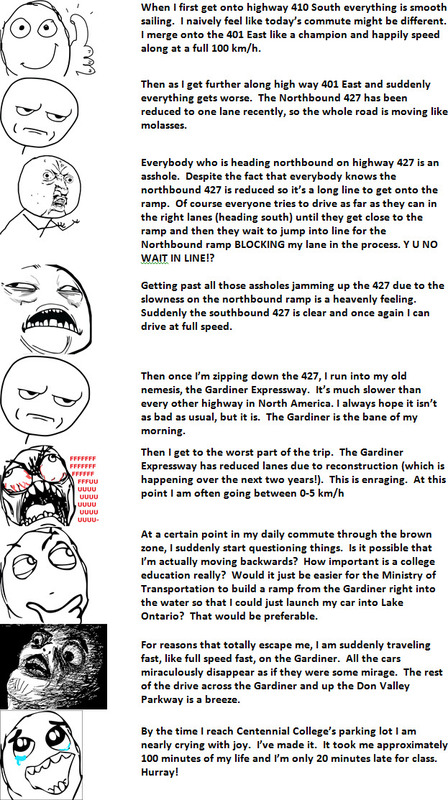 This entry was posted in Assignment, School life, Uncategorized and tagged Commute, Gardiner, Memes, Toronto, Traffic, Transportation on June 3, 2014 by The Benign Propagandist.